The evolution of muscle cars took an undeniable turn in the late 1970's towards the look of sleek sports cars. Cars like Pontiac's 1979 Firebird showcased a lower profile stance with aerodynamic body lines, but still boasted impressive power under the hood. This big 1:16 scale plastic model kit from MPC showcases this notable shift in the design aesthetic by supplying tons of detail inside and out. It features include clear T-tops, opening doors that expose the authentic interior, plus a detailed engine compartment and chassis. Firebird hood decals and a pictorial assembly booklet round out the release. 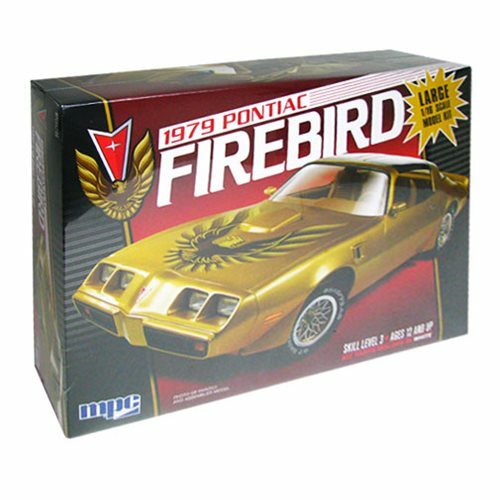 The 1979 Pontiac Firebird 1:16 Scale Model Kit is a skill level 2 kit that requires paint and glue for assembly. Ages 12 and up.